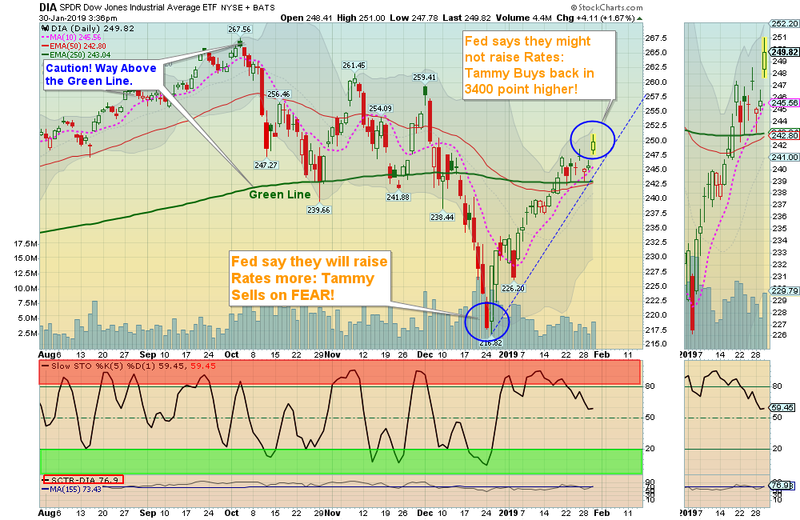 The FED is not helping Investors! Markets were up big today on FED talk and better Earnings from AAPL & AMD. The DOW Index of 30 Companies has bounced nicely, but the S&P 500 is just now back up to the Green Line of 2688. Investors are feeling much more confident lately, but remember that many stocks like Apple have not recovered very much at all. Crude Oil was up $0.90 today at $54.20. DXCM DEXCOM, INC. Money Wave Buy today. DXCM will not be logged as the Volume is below average. VHC VIRNEX X HOLDING CO. Money Wave Buy today. VHC will not be logged as it is already up 4.4% today. LLY ELI LILLY & CO. Money Wave must Close in the Green Zone. EXIT AMD ADVANCED MICRO on the Close today, or have a tight Sell Stop below it to capture a 12% Gain (2nd Buy only). EXIT SH S&P 500 INVERSE FUND if it is going to Close below Support of $29.35. LOWER the Sell Stop Loss on UNG US NAT”L. GAS FUND to $25.19.